Back to Crich for the latest delve into the archives with a view of a tram which is currently on the list of those needing attention before it will run again. The tram is of course Blackpool & Fleetwood Rack 2 which dates from 1898 having been one of the first trams to run on the Tramroad. Its preservation career officially started in 1963 when it was moved to Crich but it had in fact been restored three years earlier for the 75th anniversary of the Blackpool Tramway having survived as a works car since withdrawal as a passenger tram. 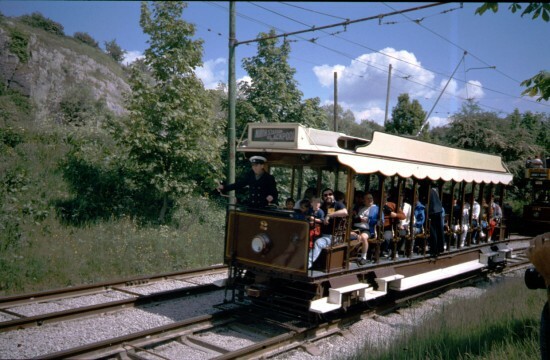 At Crich it became the first electric tram to carry passengers and has been a regular performer ever since. It is currently, however, out of service having been withdrawn from service in 2014 requiring workshop attention. This view shows 2 – before work which saw it lose the destination blinds – on 14th June 1989. London County Council 106 is also seen in the photo. This entry was posted in Crich Tramway Village, Picture in Time. Bookmark the permalink.